1. To operate and maintain RISC servers installed for the databases of all three packages i.e. MMIS, AFRES & PRIME. 2. Maintenance of the Computer Systems including PC based Systems, Printers, Scanners and other Peripherals of DMW through centralized AMC. 3. Provision of the Technical vetting of Hardware items related to computers & printers. 4. Provision of LAN facilities to the officers and staff of DMW as per priority and maintenance of the network. 5. Maintenance of DMW Website through CRIS/New Delhi and to interact with users as per Vigilance and Railway Board directives. 6. Procurement of Hardware for EDP & Software / licenses for Operating System & Application Software for whole DMW. 7. Data Base Administration of PRIME, AFRES & MMIS packages and backup management of these packages. 8. Maintenance of Master Records of PRIME, processing of the Salary, Printing of the Salary bills and Allied Vouchers. 9. In house maintenance and Modifications in the applications like MMIS, AFRES & PRIME package as per the requirements of stores, Accounts and Personnel Departments and as per Railway Board Directives. 10.To impart Computer Awareness training to the staff through local agencies. 11.Railnet is available to provide Internet facilities in the Administrative Building and Workshop; however Lease Line obtained by ASTE from BSNL is available to deal with exigencies. 1. To coordinate with M/s CRIS regarding any issue arising out in AIMS/IPAS. 2. Approved changes required in the package & up keeping of the package. 3. Training to the users & solution to the user related problem in AIMS/AFRES. 5. New development/modifications in AIMS/IPAS as desired by the users with the consultation of CRIS. 6. Upkeeping & backup of the data of AFRES package. 7. Liaison with the other departments and correspondence. 8. Other Miscellaneous official work assigned by Sr. EDPM and AEDPM. 1. Running of iMMS(CRIS based) package. 2. To coordinate with M/s CRIS regarding any issue arising out in iMMS. 3. Approved changes required in the iMMS/MMIS package. 4. Training to the users and solution to the user related problem. 5. Up keeping of the package so that it may be available to the users. 6. Liaisoning with the other departments and correspondence. 7. Timely generation of the various reports as per schedules. 8. Data backup of MMIS package. 9. To ensure Audit trails are activated properly and observed regularly. 10. Keep all dealing files in his custody related to MMIS. 11. Other Miscellaneous official work assigned by Sr. EDPM and AEDPM. 1. Evaluating all the proposal of EDP from financial angle. 2. Dealing with all types of tender, A&C DAL and other post contract activities in connection with AMC of all types. 3. All Budgets related correspondence, compilation etc. 4. Verification of all types of bills in his capacity as supervisor. 5. Initiating proposals in connection with all type of training to staff. 6. Liaisoning with the Accounts department in the case of official matters pertaining to EDP Centre. 7. Other Miscellaneous official work assigned by Sr. EDPM and AEDPM. 1. Processing of the Salary bills through AIMS application and allied activities related to salary like incentive, Electrical recover, Quarter Security Recovery etc. 2. Feeding of Data related of Incentive of Supervisors and Non punching staff, NDA, Colony security charges, Overtime, Electricity & CUG bill in PRIME & IPAS as and when required. 4. Carry out the approved changes of PRIME, application in consultation with SE/AIMS. 5. modification and development of new module, forms & reports if required and duly approved by competent authority. 6. Liasoning with the other departments and correpondence. 7. Take the periodical backup of the PRIME database. 8. Upkeep of the package so that it may be available to user. 10. Other Miscellaneous official work assigned by Sr. EDPM and AEDPM. 2. Installation & maintainence of Servers & other hardware in DMW. 3. Provision of Computer training to officers and staff of DMW. 4. To manage IT Security, Firewall and Antivirus. 5. Provision of new LAN points, Wifi & Maintainence of overall LAN. 6. Take assistance from Sr. SO/EDP regarding Finance vetting, concurrence, procurement viz Schedule of powers. 1. To assist Sh. Bhupesh Kumar Jindal(SE- iMMS) for the implementation of iMMS in DMW. 2. Runing of MMIS package in DMW. 3. To coordinate with M/s CRIS regarding any issue arising out in iMMS. 4. Approved changes required in the iMMs/MMIS package. 5. Upkeep of the package so that it may be available to user. 6. Keep all dealing files in his custody. 7. Data backup of MMIS package. 8. Training to the users and solution to the user related problem. 9. Liaisoning with the other departments and correspondence. 11. To ensure Audit trails are activated properly and observed regularly. 1. Procurement, distribution record of items procured under centralized procurement. 2. Procurement, stock verification and condemnation of T&P items. 2. Procurement, stock verification and condemnation of consummable items. 3. Keep all dealing files in his custody. 4. Typing work and other work assigned according to the exingencies of time. 5. Development and maintainence of DMW intranet portal. 6. Maintainence /Updating of DMW website in Liason with other departments/ users & CRIS. 7. Maintenance of EDP library. 8. Keep all dealing files in his custody. 9. Procurement of software & maintainence of software library in DMW. 10. Data for accrual accounting. 11. Other miscellaneous official work assigned by St. EDPM and AEDPM. 12. Training of staff in computers. 1. She will assist the Sr. Engineer/Hardware & Sr. SO/EDp for dealig all type of tenders, A&C, DAL and AMCs and other post contract activities in AMCs cases. 2. Processing of bills of works contracts 7 AMCs. 3. Maintainence of Imprest Account, recoupment and all other works related with imprest. 4. Preperation of all types of statements in connection with Hindi PCDO, MPR, MCDO etc. 5. Preperation of Absentee statement and maintainence of leave accounts. 7. Keep all dealing files in her custody. 8. Typing work and other work assigned according to the exingencies of time. 9. 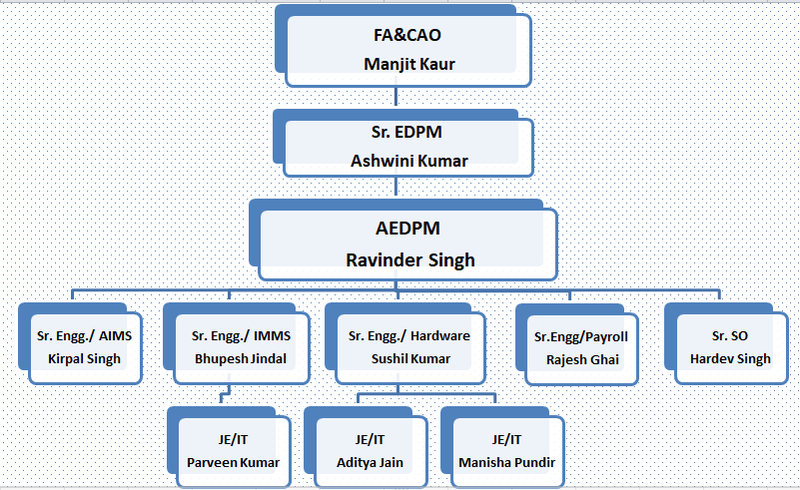 Other miscellaneous official work assigned by St. EDPM and AEDPM.